The present study aimed to investigate whether chimpanzees (Pan troglodytes) could learn a transverse pattern by being trained in the rules of the rock-paper-scissors game in which "paper" beats "rock," "rock" beats "scissors," and "scissors" beats "paper." Additionally, this study compared the learning processes between chimpanzees and children. 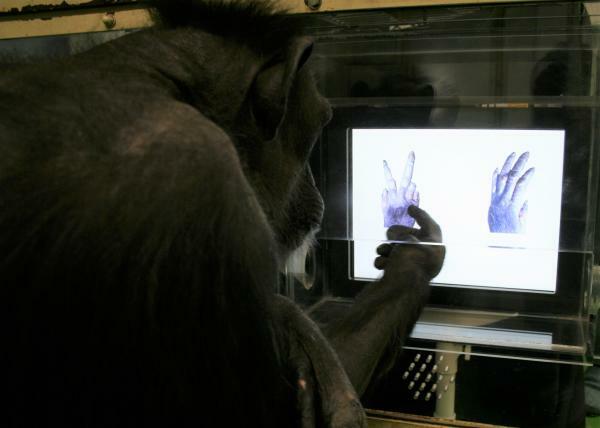 Seven chimpanzees were tested using a computer-controlled task. They were trained to choose the stronger of two options according to the game rules. The chimpanzees first engaged in the paper-rock sessions until they reached the learning criterion. Subsequently, they engaged in the rock-scissors and scissors-paper sessions, before progressing to sessions with all three pairs mixed. Five of the seven chimpanzees completed training after a mean of 307 sessions, which indicates that they learned the circular pattern. The chimpanzees required more scissors-paper sessions (14.29 ± 6.89), the third learnt pair, than paper-rock (1.71 ± 0.18) and rock-scissors (3.14 ± 0.70) sessions, suggesting they had difficulty finalizing the circularity. The chimpanzees then received generalization tests using new stimuli, which they learned quickly. A similar procedure was performed with children (35-71 months, n = 38) who needed the same number of trials for all three pairs during single-paired sessions. Their accuracy during the mixed-pair sessions improved with age and was better than chance from 50 months of age, which indicates that the ability to solve the transverse patterning problem might develop at around 4 years of age. The present findings show that chimpanzees were able to learn the task but had difficulties with circularity, whereas children learned the task more easily and developed the relevant ability at approximately 4 years of age. Furthermore, the chimpanzeesăŕ performance during the mixed-pair sessions was similar to that of 4-year-old children during the corresponding stage of training.